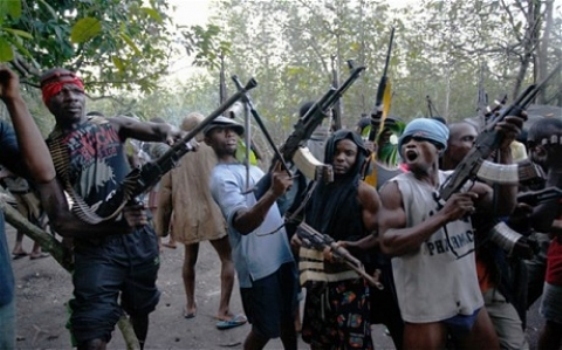 LAGOS MAY 13TH (URHOBOTODAY)-The new Niger Delta Militant group, Niger Delta Avengers has revealed that its intention is to establish a sovereign Niger Delta State. The group exposed all Northerners owning ninety percent of the oil blocks in Niger Delta and threaten to blow the oil blocks within seven days if they did not shut them down. They described the likes of Tompolo and other ex-militants as cowards who fought for their personal interest. “From the high command of the Niger Delta Avengers we congratulating all strike teams of the Avengers without taking any innocent life or that of the Nigeria military we were able to shut down 50% of crude production. We have been seeing a lot on the media about us. Some are asking, “Who are you avenging?” some calling us empty heads, ex-agitators have been condemning us on daily basis. Our criticizer from other part of the country, we don’t have any thing to tell you because you clearly don’t know how life is in the region. To ex-agitators of the likes of Tompolo, We know why you people are after us. Our agitation is more civilize than yours the Niger Delta Avengers is more concern with people of Niger Delta unlike you (ex-agitations) that were into kidnapping, killing of Nigeria soldiers, sea pirates, vessel and tanker hijacking. But we were able to carry out all our operations without killing a fly. We have sophisticated arms far better than what you use to have during your kidnapping days. Lets make it clear, to you our elder brothers (ex-agitators) that we are not begging you to join this agitation. We are young, educated, well travelled and most of us were educated in east Europe but don’t worry when we achieved our goal (sovereign state of Niger Delta) then you people will be proud of us. In as much as we respect you as our elder brothers (ex-agitators) please don’t dare to stand on our way because if you do we will crash you. To the Nigeria military the Niger Delta avengers is among you. And we know all your plans so we will always ten steps ahead of you. In our meeting comprising all heads of the strike teams, which was held in Bayelsa. The Niger Delta Avengers high Command comes to the conclusion that, if the military harass or invade any community in the region then you (Nigeria military) will get a feel of the Avengers. To the President of Nigeria Buhari, we are sure you have not been to the creeks of the Niger delta before and 90% of your cabinets does not know how the region looks like. You think the Niger delta region is full of animals, who are going to frustrate your government. Your government that is not following rule of law, unlawful detention of innocent people just likes of Nnamdi Kanu. All he wanted was to let his people go. Nnamdi kanu didn’t carry any arm against this country but was incarcerated. We want you to know that’s no civilize President will behaves this way. If that is how you devised to run the country we will prefer you do that in the northern region. When couples are tired of living together to make peace they go their separate ways. That is what Nnamdi kanu and the Niger deltans are asking. You always say you fought for the unity of this country during the civil war. You haven’t been to the Niger delta, how can you know what the people are facing I believe your Vice will tell how the region is suffering and under developed when he visited the forcados terminal. That is if he ever looks out of his helicopter window. 1. Apo Well was awarded to Sapetro Oil owned by Gen Theophilus Y Danjuma .Apo field is capable of producing 300,000 barrels per day and crude reserve of 500 million barrels. From our analysis above, 90% oil blocs are allocated to individuals from northern Nigeria and some confused elements from the region are calling the Niger Delta Avengers names, some are calling us criminals. Our question to these groups of individuals calling us names are; where were you when all these atrocities were happening to the people of the Niger Delta? IT’S A PITY. To owners and operators of these oil blocs in our region the Niger Delta Avengers is giving you two weeks ultimatum to shut down your operations and evacuates your staff. If at the end of the ultimatum and you still operating. We will blow up all the locations. It will be bloody. So just shut down your operations and leave. No agent or representative of the Avengers has called the Minister of State for Petroleum Resources and Nigerian National Petroleum Corporation, NNPC, Group Managing Director, Dr. Ibe Kachikwu to threaten his life. To all International Oil Companies, Indigenous Oil Companies and Contractors ,if anyone called saying they are members of Avengers please do not listen or take them serious because our ideology and belief is far from that. Once again on behalf of all the commanders of the avengers strike teams we congratulate our loyal and gallant soldiers who put human life before their targets. On behalf of the Niger Delta people we said congratulation as we have cripple the Nigeria economy by 50% by the grace of God we will make it 100% if our demands are not met soon. To the United Nations, we are not asking for much but to free the people of the Niger Delta from environmental pollution, slavery, and oppression. We want a country that will turn the creeks of the Niger delta to a tourism heaven, a country that will achieve its full potentials, a country that will make health care system accessible by everyone. With Niger delta still under the country Nigeria we can’t make it possible. So we are calling on the Ban Ki-Moon Secretary General United Nations and all Heads of the government of the five Permanent Security Council members to come to the aid of Niger delta people. We are calling on world leaders to come to the Niger delta to see the atrocities committed by the Nigeria government.